Growing up on a tropical island, coconuts were definitely not in short supply. Coconut trees are everywhere, men climb them from the time they are young boys, and when you go to the beach, don't lay out on the sand under a tree because a coconut just might fall on you! Coconuts are sliced open skillfully and easily with a cutlass (machete), and the sweet water is drunk straight from the nut. They are then split open and the soft jelly inside is eaten, using a small part of the husk that was sliced off as a spoon. As a child, when your mother wanted to cook with coconuts, you were given the fun task of throwing the dried coconut against the hard ground to break it open. When it split open, we would collect the pieces so the meat (hardened jelly) could be grated, then used in a delicious dish. Blueberries may be small, but they are high in Vitamin C and antioxidants. They are a good source of dietary fiber, and are low in fat, making them one of my favorite go-to snacks! The kids love them for their beautiful blue-purple color and sweet juiciness. To find out more about winter fresh blueberries and their amazing health benefits, visit littlebluedynamos.com. Needless to say, I am excited about this recipe, because it combines two of my favorite fruits, blueberries and coconuts. 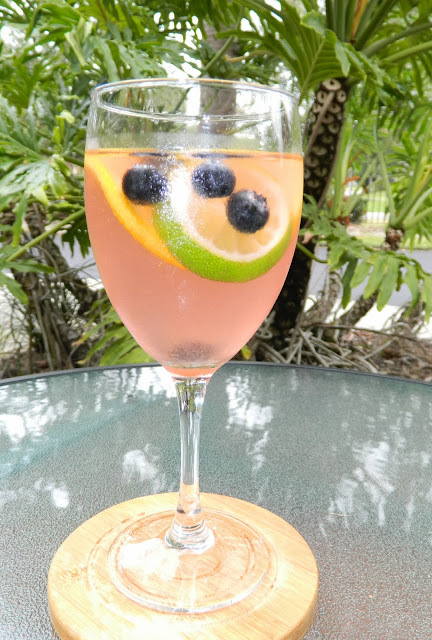 Different from your regular sangria, this drink has fresh blueberries, orange and lime soaking in a refreshing mixture of coconut water and white wine. Ginger ale is added just before serving for a little fizz. The blueberries are smashed first to release more flavor, and when left to soak and chill overnight, they give the drink a beautiful light purple color. 1. Reserve 1/4 of the blueberries for garnish. Place the rest in a bowl and smash with the back of a spoon. 2. Combine smashed berries, orange and lime wheels in a large pitcher. Add coconut water and white wine. Stir well and place in fridge overnight to chill. 3. Just before serving, strain into a new pitcher. Add ginger ale and stir. Pour into glasses and garnish with the reserved blueberries and some of the orange and lime wheels. This drink is visually on point and tasted great!